The potential result: crippled economies, compromised public safety, submerged infrastructure, and a forced retreat from our iconic Pacific coast. 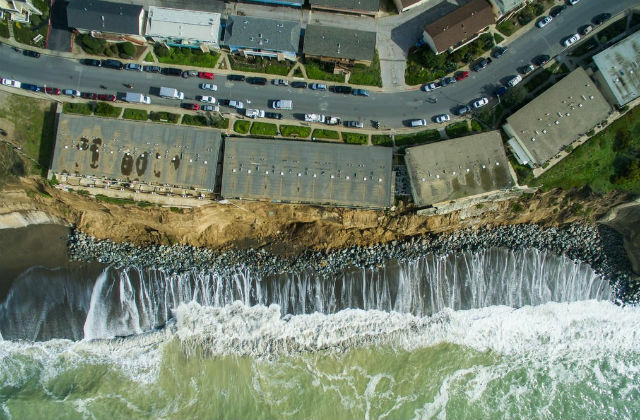 Housing perched on fast-eroding coastal bluffs in Pacifica, Solana Beach and elsewhere will continue to crash into the sea. Power plants, nuclear waste sites and other sensitive waterside sites need to be fortified or lost. More than 42,000 homes in California will be under water—not merely flooded, but with seawater over roofs. The 10-foot rise scenario, which scientists peg as the new worst-case, would cause a land loss of 800 feet—the length of two-and-a-half football fields. The sobering fact of those state-of-the-art reports, recent though they are, is that they are already out of date and not nearly comprehensive enough in describing the scale of what currently faces California. What scientists are observing now is, they say, a rapid and steep change that, even as it unfolds over comparatively long periods of time, is nonetheless occurring at a breathtaking pace. Zillow’s chief economist, Svenja Gudell, said she was surprised that when the company shared its information with mayors or city planners, officials saw it as an event that would take place far in the future. She said real estate values in beach areas destroyed by Hurricane Sandy are now higher than before the superstorm that played out on national television in the fall of 2012. Even with the horrific projections scientists have repeatedly shared about public health and safety associated with rising seas, it might be the economic cost that spurs action. A 2016 paper published in Nature Climate Change estimated the annual global cost for sea-level rise adaptation measures at about $421 billion per year. The authors of the study argue that the figure doesn’t take into account population growth and clustering around coasts. By the year 2100, the report warns, the price tag for mass relocations could exceed $14 trillion. Given California’s coastal population clusters—75 percent of the state’s residents live in a coastal county—the figure here will be enormous. The report placed the scientific findings at the forefront. That means the analysis does not entertain the question of whether climate change is altering the behavior of the Pacific. Nor does it belabor stale arguments about how weather has always changed. It is, rather, an unsparing document that presents the best projections about the range of sea rise, and, for the first time, assigns a probability and risk to those numbers. So what now? California planners and policymakers will pore over the latest report. The final document will help local officials incorporate the sea-level rise projections into their future plans for building and safety, in some cases altering zoning and building codes. CALmatters is a nonprofit, nonpartisan media venture explaining California policies and politics. This is a trimmed version of the complete story, available at CALmatters.org.